Julia Morgan (1872-1957) was born in San Francisco and spent many of her growing up years in Oakland. She was the first woman licensed, in 1904, to practice architecture in California. One of the hallmarks of her diverse architectural designs is stability, inspired by her experience of living in an earthquake prone region and of the San Francisco earthquake of 1906. Some of her design commissions were for churches or other buildings associated with faith traditions. Morgan incorporated sacred symbolism such as the use of circular and octagonal windows and stylized crosses, as well as the Star of David motif for the building at 300 Page Street. St. John�s Presbyterian Church in Berkeley, now the Julia Morgan Center for the Performing Arts, is a wood frame building in the Craftsman tradition. It was completed in 1910. The First Swedish Baptist Church, built in 1926 in Oakland, is now the Lakeside Baptist Church. Morgan designed it in a �Mediterranean� style that she used in many of her buildings. United Presbyterian Church in Oakland, now College Avenue Presbyterian Church, was completed in 1917. It includes an elegant circular window over the main entrance and exposed wood on the exterior and the interior. The Chapel of the Chimes in Oakland is a columbarium (a place for the storage of urns holding a deceased�s cremated remains). Morgan worked on renovations and designed additions to the building, which houses several chapels. The Berkeley Baptist Divinity School, built 1918-19, has architectural features that resemble the 300 Page Street building, though it has a peaked slate roof rather than a flat roof. Its reinforced concrete and red brick construction convey a similar solidity and weight. The Methodist Chinese Mission School in San Francisco�s Chinatown also has some similar features to the 300 Page Street building, particularly the iron balconies and the roof eaves, as well as the use of red brick. 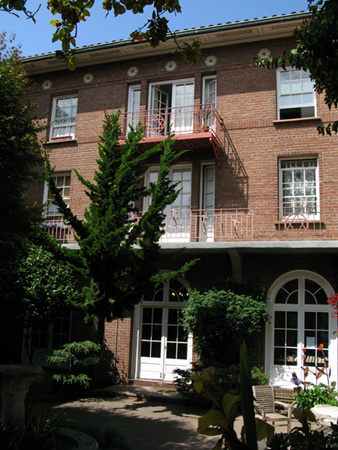 As described in Mary Morgan�s Sangha News article of Sept 29, Zen Center�s City Center at 300 Page Street, designed by Morgan and completed in 1922, was commissioned by the Emanu-el Sisterhood for Personal Service as a residence for single Jewish women. The Star of David motif is integrated into the ironwork of the building�s balconies. There are mezuzah, protective scrolls, at the doorways to some of the rooms, a remembrance of the original residential and spiritual purpose of the building. The first is a panel discussion, The Architecture of Julia Morgan and Sacred Spaces on Friday evening, October 12, 7:30-9:30pm. Participating in the panel are moderator and architectural historian Mitchell Schwarzer, architect Susie Coliver, designer and Buddhist priest Paul Discoe, and architect Craig W. Hartman. Also offered is a workshop, Moving in Space: Architectural Awareness as Mindfulness Practice on Saturday afternoon, October 13, 1:30-4:30pm. The leaders of the workshop – Shosan Victoria Austin, Christopher Shelton, Karin Payson, Galen Cranz, and Glenn Lym – have combined backgrounds in architecture, design, body practices, and Buddhist practice. Please join Zen Center for these events highlighting the history of architecture, Julia Morgan’s design of 300 Page Street, and sacred space that can be adapted for various uses and traditions. Also part of these events are exhibits in the City Center Art Lounge and main hallway.